I have to tell you, I had a fabulous week this past week! * Salmon burger - yum, yum! 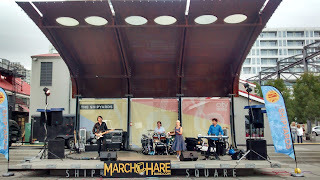 * March Hare Band (www.marchhareband.com), a great band to dance to! What are you grateful for at this time? Today/yesterday/this past week? Lovely list...salmon burger sounds delish! The joy of little things that add up to an awesome day, isn't it, Elly? Keep at it.